In one robust, compact package, the patented Racor CCV® closed crankcase ventilation filter systems provide superior oil coalescence and crankcase pressure control under the most severe conditions. The only routine maintenance required for the Racor Crankcase Ventilation Filter System is filter replacement. Typical service life of the high-performance filter in diesel applications is 750 hours. Some variations in service life occur depending on load profile, engine wear condition, flow and aerosol mass concentration of crankcase emissions, and soot concentration. Racor CCV® application is determined by crankcase flow in CFM. CFM on new engines is low but as the engine wears on, the CFM increases. Select the correct Racor CCV® model by dividing the engine horsepower output by 40. 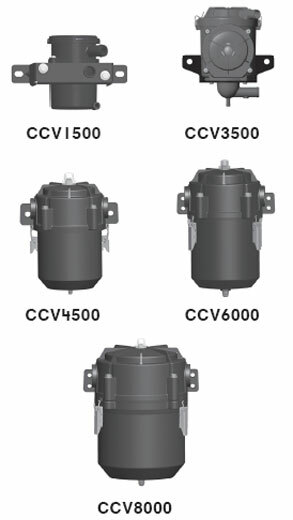 Single CCV® units are designed to handle various crankcase flow rates up to 40 CFM. Traditionally, the crankcase flow rate can be calculated as follows: Rated horsepower ÷ 40 = cubic feet per minute (CFM). This formula can only be used as a guide since recent improvements in piston design have produced engines with higher horsepower and lower blow-by flow rates. The blow-by flow rate of a worn engine, at time of overhaul, is generally double the flow rate when the engine is new. The flow rate of a worn engine is factored into the formula.